I'll be without a laptop for a few days but hopefully will be able to keep posting through the Christmas period. Kininvie is a still house in the grounds of the Balvenie Distillery. In my opinion, it is not a distillery. Only a brand. Why do I think that? Well, have a look at Wikipedia, then Malt Madness. Kininvie does not have a mash tun or fermenting tanks, all that is done at Balvenie. Compare that to Macallan, who have 3 seperate distilleries on the same estate and still refer to it as the same single malt and you'll start to see the line a little blurred. Is this still house even in production at the moment? No one seems to know. 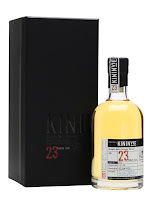 With the new Ailsa Bay distillery in Girvan, I doubt William Grant even need the Kininvie still house any more. Who cares? Well, maybe the people buying the 35cl bottles for £120?! What are they getting for all that money? A whisky that was made to satisfy more demand for blends. Yep, it's a filler malt from Balvenie Distillery. In my opinion. Nose: Light, malty, floral, lots of clean grainy notes, pressed flowers and lavender. Taste: Very malty, grain, light, floral notes and a clean natural sweetness. Finish: Short/Medium length. More oak comes through. I would have thought this is the latest batch, but unsure on exact batch/vintage. Not bad at all but the price is absolutely crazy. Apologies for the rant, but I'd hate for people to actually buying this not knowing anything about it.